Wow this was really helpful. Thanks. Haven’t had to fill out one of these for proper yet, but I’ve bookmarked the link should that time come. Great work! Wow! this is SUPER helpful. very in-depth. I was just wondering, when listing one’s job history, it seems to be just a list of employers. is there any need to specify one’s former position at the company? or is that something addressed later, in an interview, for example? Shannon, you’re right, the rirekisho simply lists job history, not positions held. What exactly you did at the company would be, as you said, addressed during the interview itself (or via a shokumukeirekisho, the *other* Japanese resume that, at least in my experience, isn’t requested that often). Thanks for posting this. Especially the template. This is incredibly helpful. You should win an award for your diligence. Not even some of the Japanese sites I have been browsing go into so much depth about what should be said and how one should say it as you do. Also, the template is very useful. Would there be problems though if someone handed in a resume that was in landscape view as opposed to two portrait pages of document? Thanks! Thanks for the kind words, Ben. It was the paucity of cosolidated rirekisho-writing info. on both the English and Japanese internets that made me want to post this in the first place. Hopefully it will be of some use to you. I’m afraid I don’t quite follow your question though. Two pages instead of one? The document appears as a single … uh, rectangular page for me, which I assume would be landscape. Is the document bleeding out onto a second page for you? Great entry. I think that a lot of people will find it useful, but I have to take issue on one area. I think that when it comes to writing your name on the RIREKI it should be your legal name. 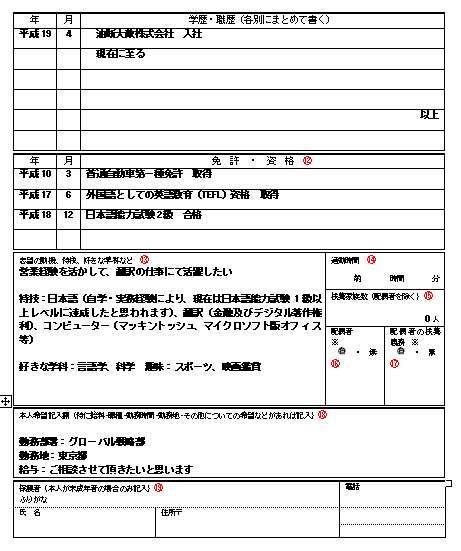 Which for foreigners in Japan is their name as it appears on the Alien Registration Card. If you look at your ARC you’ll see that your name is written Family name, followed by given names in block alphabet. So on your RIREKI and any other legal or semi-legal documents in Japan (for example an application for a bank account) your name should be written this way. It might look strange, but it is your legal name. Anyway, don’t take my word for it. I agree with you that there is very little good information on the Internet either in Japanese or English. The truth is that most Japanese people don’t understand the conventions for writing a RIREKI. Which is why I went to the bookstore and bought 3 REKISHO KAKIKATA books. Thanks for the comment. BTW, I don’t have to take anyone’s word on naming conventions on the rirekisho — I’ve landed all my jobs here with my natural name order intact and in katakana, and haven’t received a single comment from either recruiters or prospective employers. Never saw flipped/Romanized name order when I used to review foreign rirekisho at my old company either. The flipped version is used for bank accounts, etc. but for rirekisho it’s a non-issue; it’s a work history, not a document for legal or business-transaction purposes. Thanks for posting the link at ringo.net, John. Look forward to seeing you there again. Thanks for this very well done article. It is very helpfull and goes well into the details. Thank you very much for this! It was very enlightening. I’m currently applying for an exchange year and my university wants me to write a CV (in table form) ‘that adheres to what is common in the target country’ so I’m having a hard time now deciding what to put in. I thought I’d stick to the contents of a rirekishou but a lot of it just doesn’t fit this purpose. Currently I only included personal data, education and (part-time) work history and the whole thing is rather short and bare. I wonder whether it is necessary/advisable to include hobbies and favourite subjects or anything else? Even if you have no idea about that, I’d also appreciate any kind of opinion. Thank you and sorry for bothering! THANK YOU SO MUCH IT WWASSSSSSSS SOOO HELPFUL IN THE KANJI COMMAND,ARIGATOO NE! I was wondering… Is it common for one to include a cover letter with his/her rirekisho, or does one just send his/her rirekisho?? If one does include a cover letter, is the format the same as in the U.S. or different? Would you mind explaining? 😀 Thanks!! I’m glad if the post was of use to you. To answer your question, no, it isn’t common to include a cover letter per se … BUT because so many rirekisho are submitted electronically these days, you need something to go into the body of the e-mail, which ends up essentially becoming your cover letter. The format is pretty standard and not at all difficult. Most definitely include part-time job experience. Many, many people here work part-time jobs before moving on to become full-time employees. And without that information, as you mention, it would be a pretty bare-looking rirekisho. Best of luck to you. Fantastic help, thank you so much! Just wondering if it’s standard to have a one-page landscape document, or should I expand the template to a two-page portrait one? The one-page layout as presented would seem to be the norm. do you have any example shokumukeirekisho? its hard to find an example in english explanation… Thanks! I have a shokumukeirekisho that I personally use, but I haven’t posted it or written up a guide for it because shokumukeirekisho format varies wildly depending on what kind of industry you’re in, duties you’ve performed, etc. Without fail, any Japanese guides I found had multiple formats grouped according to job type; after much searching, I finally said “Screw it” and modified a pre-existing format to suit my own needs. Doing likewise would probably be your best bet. Thank you for posting this. I find it extremely useful. I also appreciate the fact that you have been answering everyone’s questions very promptly on the comments section. I’m glad you’ve found the posting of use (though, as I’ve mentioned recently, it’s badly in need of an upgrade to incorporate additional information I’ve come into recently). To answer your question, there are two ways I can see that you could go about this. One of the things I’ve learned recently regarding the rirekisho is that it’s all right to add a bit more information to explain the choices you’ve made regarding your educational and work history. In your case, you may consider something like 「ＸＸ株式会社に雇用された為、途中退学しました」, or, “Left [university] prior to graduation due to having been hired at Company X.” This provides a valid and respectable reason for your not having completed your second degree. This is obviously an ethical decision, and I am not advocating one course of action over another; just let it be known that there will be *zero* effort on the part of your potential employer to verify your educational history (and in many cases, your work history), so bending the truth and saying you completed your degree is an option. Hope this helps, NN. Take care. thanx for the great walkthrough. like others I have the problem of having to send in a 職務経歴書 for a position i try to apply. on the other hand, my japanese is not that great. You think a 履歴書 could be enough as a sign of good will, after an english version is handed in already? The HR is informed of my low japanese skills, so this gives me quite some head ache! but your walkthrough helped to create a good 履歴書. very very helpfull! Thank you for posting this! Please note that I’ve never done an internship myself, so unlike other aspects of the rirekisho write-up, I can’t say, ” I know this and stand by it because I’ve personally experienced it!” That being said, my guess would be something like “研修期間が終了したため、[outcome],” as in 帰国しました if you went back to your home country, 退社しました if you left the company and are still in Japan, and so on. Hope this helps. Thanks very much for this. I’m filling out my first rirekisho now! Hi! Like everyone else, Wow! this is helpful! Thanks so much for your time and effort! Question: What if, through my home university, I participated in a study abroad program at another school? Technically, I was still ‘enrolled’ with my home university while studying abroad, so I didn’t really ‘leave’ my original school. Would saying something like 留学するため、転校 suffice, and then upon return, write 再入学? Please see the answer to Tony’s question below. Thanks. Of all the “useful” tips on the web, you seemed to be the only one to provide us with both downloadable rirekisho template and a detailed walkthrough with tips. I think I speak for all who come upon this walkthrough when I say “thanks a million”. My being unable to find a good, clear write-up when doing my own rirekisho was exactly what made me want to write this entry. Hope it helped. Thank you so much for posting this! An internship I am applying for requires a Rirekisho, and as I’ve never written one, I am eternally grateful to you for writing this up in so much detail. I have a quick question for you regarding the 学歴 section. I studied abroad for a year, and wondered if this should be included. I was thinking of something along the lines of “XX大学XX学部XX学科留学開始／完成”…would that be appropriate? Please see the reply to Tony’s comment below. Sorry it took me a while to get around to answering. Extremely helpful, and I’m looking forward to making my own. Hey, I have a question about this. I am planning to move in with my boyfriend in Japan after I graduate next year, but I don’t know any Japanese formally. I want to obviously work, but I don’t know what resumes I should have, if I should fill out the rirekisho in English, get someone who knows Japanese to write it for me, or just use an English resume. Tracey, can you please specify what you mean by “don’t know any Japanese formally”? If you mean you can speak “survival Japanese,” it’s possible you could get something that wouldn’t require much/advanced Japanese, but odds are very high it won’t pay anywhere as much as English teaching would. If you’re in Japan for the long haul, my advice would be to begin with teaching, in which case only an English-language resume would be required, and build up your language skillset (if I’m understanding your situation properly) until you can leave English teaching behind and move into a more Japanese-intensive position, at which case a full-blown rirekisho would be required. One thing you do NOT want to do is submit a resume that someone else has written for you. The rirekisho is a statement of who you are and what you are capable of. Believe me, the question of who wrote your rirekisho *will* come up, and that person not being you is a big strike against you. I say this having been privy to/part of the interview process. Best of luck to you. Thank you so much for this, its incredibly useful. I have moved a lot in my life so my 履歴書 might look quite full when done, I was wondering if it’s ok to expand it or if the norm is to cut things out for schools or jobs if there are too many to list… Sorry it’s a bit of a random question! Thank you for your good posting. Could you give me some advise about filling my rirekisho? I have just returned my hometown around the beginning of this year after graduated my degree. Now I have received some mails from the recruitment agency inJapan, they ask me to send my resume. Actually I really want to find a job in Japan and I want to tell them that I can go to Japan for the final interview, if they want. What &how are the good way/sentences that I should tell them when I reply? Thank you so much and please advise. Thanks for doing this for gaijin. I am married and have been living in Japan for about three years. I will be applying to we’ll say for the sake of this post, “Sony Japan”. This multinational corporation has a very nice job posting and I’ll need a Japanese CV. Not the regular pre-formatted resumes such as the template you kindly posted for us (similar resumes can be found at convenience stores), but an original resume for a more executive post. Do you have any examples of an appropriate resume for this type of position? 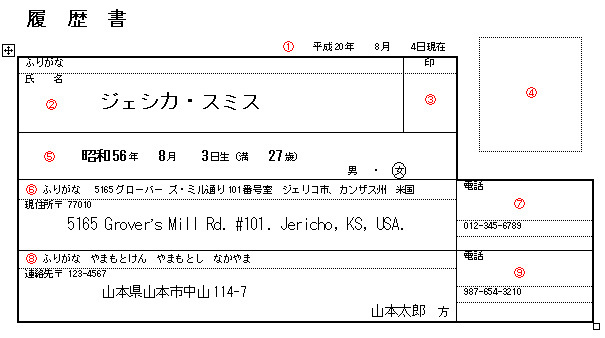 I’ve seen Japanese at cafes making these kinds of resumes so I know they’re pretty common for people who are not university recruits. Any formatting or stylistic advice would be appreciated. Thanks for your blog! It’s a lot of help. – Would you list a university you studied abroad at while attending your home university? And if so, should I just list it chronologically between the 入学 and 卒業 lines of my home university? According to the internets, you would list study abroad as a separate explanation after the graduation, i.e., list 入学 and 卒業 as shown, then below that (leaving the date sections blank) write something like 平成A年B月よりC年間休学し[country]D大学へ留学, plugging in A-D with the information relevant to you. Thanks. hi. just wanted to say how helpful this was. took me a while but i managed to fill out the rirekisho and everything thanks to your step by step instructions. Thank you so much for this extraordinary lesson in “Rikekisho-Writing 101.” I have downloaded your forms and am in the process of typing up a fine rirekisho, which I know will very much impress the person to whom I am going to send my job application! Do you mind if I asked you a question re. the section on 職歴? How would you phrase something like “I have been self-employed since (year), working as a consultant and photo-designer.”? Any feedback would be very much appreciated. Again, thank you for this great service, it is a huge boost to my application package! From what I gather, filling in the start date, same as if you had entered a company, and writing something like 個人フォトデザイン及びコンサルタント事務所を開業 would be the way to go; if/when you cease doing this work, you would substitute 閉鎖 for 退職. You may also want to preface コンサルタント with exactly what kind of consulting work you did. Hope this helps. Thanks so much for your reply. An agency notified me about this job and had asked me to respond right away, so I already sent off my app! I ended up using the compound 自営業者 to describe my self-employed status. I put more info re. the nature of my work in parentheses. Not sure if 自営業者 sounds a little harsh or abrupt, but they’ll probably get what I’m trying to say. Overall I was very pleased to have completed my first rirekisho! I wonder if I will ever hear back from this company, but I did the best I could and certainly would not have been able to react in such a short amount of time had it not been for your rirekisho-template. I do admire your command of the Japanese language as well as the fact that you are making your skills, time, and hard work that must have gone into studying Japanese available for free. Many thanks, Izabela. I’m happy if you’ve found any of the information here useful. Take care, and best of luck. I really appreciate the clarity and detail of your explanations. 1. Undergraduate research – I spent two years volunteering in a biotech lab. It was like a part-time job, but without pay. 2. Student organizations, such as Engineers without Borders, in which I’ve invested a good amount of time working on international humanitarian projects, including traveling for site assessments and construction. Also, could I include a minor (Spanish) on the rirekisho? Should I include my expected graduation date, or simply type 現在に至る below the entrance date? Is it not customary to include scholarships on the rirekisho? Thanks a lot. Even three years later this is still tremendously useful. I’m sure I’m not the only one who was despairing of having to recreate the rikekisho in Word all by myself, so thanks for saving us all the trouble. Searched “rireikisho” for the first time and found your post. Great, i am just about to complete my resume in Japanese with your help. Thanks. I have used english instead of japanese in all the fields so far, with only the years info. etc in japanese. I think it almost renders my qualifications unreadable when I use japanese. Will it be ok to do so? 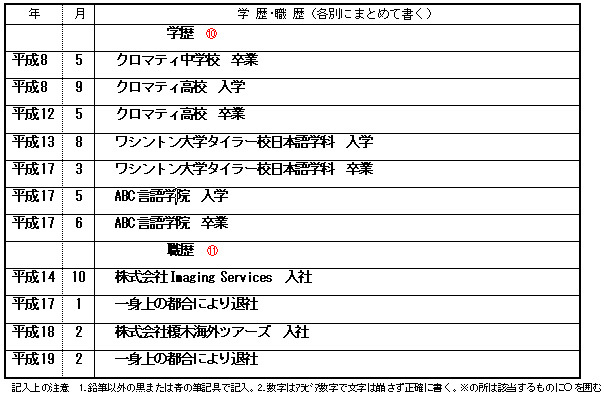 Actually I have all the japanese information stored in a document and just need to copy paste it here if need be. The answer to the “two pages” question is simple. 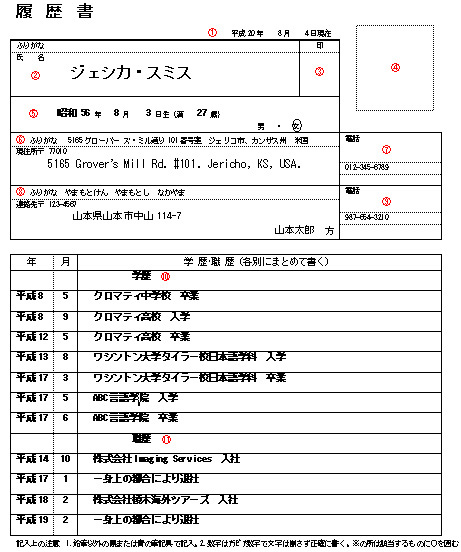 The template is set on a Japanese B4 page size, the same size as the real form that you can buy in konbini. The B4 paper is kind of big, so you have to fold it in two to put it in the B5 size envelope (that is provided with the form in konbini). Check the “Japanese B-series variant” of the “Paper size” article on Wikipedia to have an idea of the sizes. P.S. Useful template and explanation, thanks. I read all the comments and many of them where interesting, so I hope this comment can help other readers. Much appreciated, thanks! I’ve fooled around with Ruby furigana readings before and it was pretty nightmarish. Hope it was all right for you to navigate! thanks for the amazing advice! working on it right now! Thank you for the amazing advice ! It’s really helpful. Do you think it’s possible to write in english in that document ? Or only in Japanese ? Thank you again ! I would also like to know the answer to Jullet question. Thank you. A rirekisho is, by definition, a Japanese-language CV. If you’re unable to write it in Japanese, you’re 1) better off submitting an English-language CV, and 2) probably not at the skill level, Japanese-wise, that the job requires.